The LPG: Catalyst of Social Change–II conclave in Ranchi held early this week brought together an assortment of government officials, executives, civil society groups, academia social workers and women, who have availed of the scheme, to assess the Pradhan Mantri Ujjwala Yojana. The flagship programme of the current government that aims to provide households below poverty line with free LPG connections was one of the few schemes that found a place in the 2018 budget. The target was raised from 50 million households to 80 million and the connections were allocated based on the data from the 2012 Socio-Economic Caste Census. The scheme allocates Rs 1,600 per connection, a significant amount for most households targeted, to push for the adoption of LPG. Thirty million new applicants have got on-board since Ujjwala was flagged off in 2016 and the three companies tasked with implementing the programme–Indian Oil Corporation, Bharat Petroleum Corp and Hindustan Petroleum Corp have responded enthusiastically by collectively planning investments worth Rs 30,000 crores for developing the infrastructure needed to cater to the new massive growth in the market. The overarching consensus was that the programme appears to be successful, with LPG penetration in the country currently at 54 per cent up from 27 per cent in 2014. According to Ashutosh Jindal, joint secretary of the Ministry of Petroleum & Natural Gas, LPG coverage in rural areas has increased from 33 to 53.5 per cent. Implementation challenges are underscored by the sheer scale and remoteness of the target areas. Logistics and economics, predictably, continue to be a cause for concern and the most often repeated metric is the refilling rate. The continuity of LPG usage in these houses is precariously dependant on accessibility, as it can often take weeks to replace a cylinder in remote villages. During this time the household will have to revert to the chulha. The logistics of issuing the connections also have kinks that require ironing out. Citing his experiences from administering the programme in Jharkhand, which has a refilling average 7.5 times higher than the national average, Amitabh Kaushal, secretary of the department of food and public distribution said that the data in the Socio-Economic Caste Census still has gaps, especially where women are concerned. Aadhar seeding also faces issues caused by data discrepencies, especially where the spelling of names is concerned as a result of which applicants can find themselves unable to register for the scheme. With 9 per cent of India’s LPG consumption being residential, the market is highly favourable for long-term export contracts for producer countries given that there is very little seasonality. Underscoring the demand surge created by Ujjwala, in early 2017, India became the second largest domestic LPG consumer in the world, with most of the supply coming in from the Middle East. Economics and logistics aside, the issue remains a largely emotive one, especially on health grounds. Kirk Smith from the University of California cited analysis that found that indoor air pollution was the cause of 980,000 premature deaths in 2015. Residential biomass was the largest contributor to ambient air pollution by particulate matter(23.9 per cent) , surpassing that of coal (15.7 per cent). The health and environmental crisis caused by the lack of access to clean cooking fuel served as the single largest argument against concerns raised with regards to the sustained subsidy that would be required to meet the targets and sustain the momentum. The International Institute for Sustainable Development’s (IISD) 2017 report states that the Government of India spent Rs 16,056 crore on the LPG programme in 2016, over four times the subsidies allocated for renewable energy in that year. On the flipside, the health costs that are resultant of air pollution amounts to 3 per cent of the national GDP and the subsidies could prevent 65 per cent of the premature deaths caused by the same. 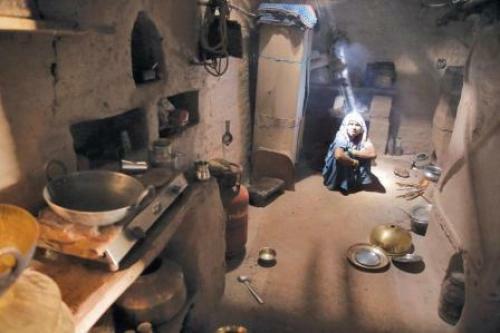 The sentiment was affirmed by support across the board for the “Give It Up” campaign, which coaxes rich and middle-class Indians to give up their LPG subsidy to help pay for the costs incurred in rural India as a result of Ujjwala. As of 2016, 10 million people had given up their subsidies. However, as of April 2017, driven by the increased cost of the LPG that sent prices skyrocketing, 112,655 people reclaimed their subsidies.